Anyway. In order to redistribute the default route(s) received from the upstreams, I wanted to use iBGP inside the ‘square’ of devices.. iBGP relies on an IGP, so I chose the coolest one available, ISIS. 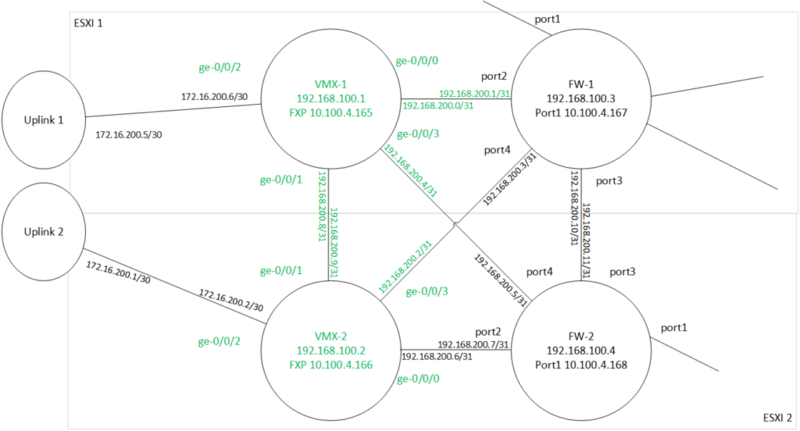 This is a very simple setup, but there was no way I could get an adjacency to form between the router and firewall (green to black in the diagram). I tried 100 things (changing hello intervals (pointless! ), LSP generation times, MTU, MTU, MTU and several other desperate things like disabling hello-padding, enabling and disabling ‘adjacency checking’ on the Forti-devices).. Nothing. Eventually, I enabled trace-options on the Junos side of things – I could see my adjacencies with the Forti-devices stuck in the ‘Initializing’ phase, implying the three-way-handshake was busted.. The traceoptions showed some guff, but nothing that pointed to an easily solvable problem (i.e. not MTU)..
All of a sudden.. My ISIS adjacencies are up and solid.